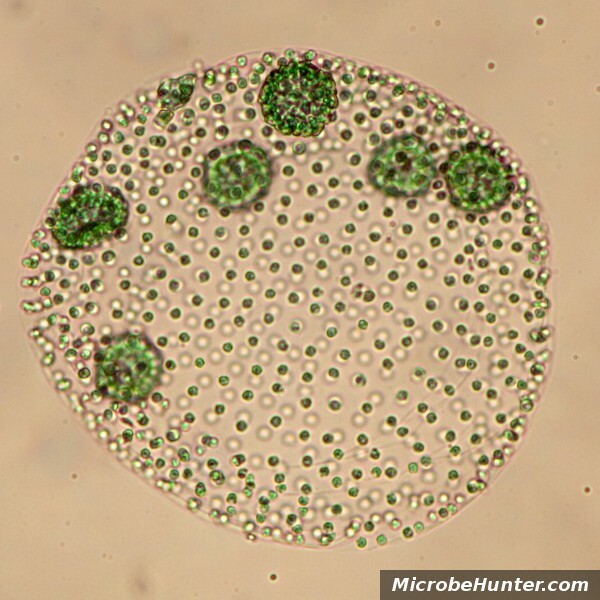 Volvox: several daughter colonies are visible inside the modther colony. The picture shows a spherical volvox colony, each ball can contain hundreds, if not thousands of individual cells. The picture shows six daughter colonies inside the main colony. The main colony disintegrates and the daughter colonies are then released. 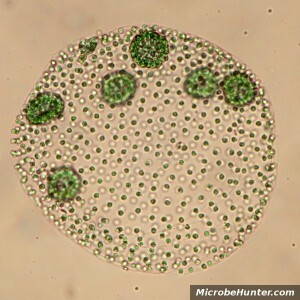 Volvox is a nice example of an organism which shows first signs of multicellularity. Larger colonies can be up to 1mm in diameter and can be seen with the unaided eye. Volvox reproduces both sexually and asexually. During asexual reproduction cells from the equator of the colony move to the inside and divide to form daughter colonies. The daughter colonies will grow and multiply. The mother colony will then rupture and release the offspring. During sexual reproduction, Volvox colonies form sperm and egg cells (ova). The sperm cells will swarm out to find ova in other colonies. The fertilized egg cells will then form new colonies. Microscopists who are interested in observing Volvox should try to investigate water samples from ponds and puddles. It is also possible to grow Volvox at home. Volvox likes to grow in nutrient-rich water. Dilute some plant fertilizer in water and add some pond water containing Volvox (or other green algae that you want to grow). Place the container on the window sill for several days but prevent direct sunlight as this may cause overheating, and drives out the CO2 for photosynthesis from the water. Alternatively, you can also use a plankton net to catch the colonies. For making permanent mounts, it’s probably best to use a water-based mounting medium such as glycerin gelatin. Solvent based media may dissolve the chlorophyll of the chloroplasts and may cause the cells to lose water and shrink.